SEAT has announced that an Ateca model whose spec is based on 13,000 online configurator users will cost from £21,995. Only 200 of the ‘First Edition’ models will be made, with the specification including 18-inch two-tone alloys, an electric tailgate and a rear view camera. The Ateca launches 9 September but the order books open 1 June, with prices starting at £17,990 for a 115PS 1.0-litre TSI version and topping out with the £29,990 four-wheel drive XCELLENCE version, complete with an automatic gearbox and 190PS 2.0-litre TDI diesel engine. That pricing structure means a First Edition with the 1.0-litre commands a £4005 premium over a base spec model with the same engine; the First Edition is also available with a 1.6-litre TDI diesel, priced at £24,305. 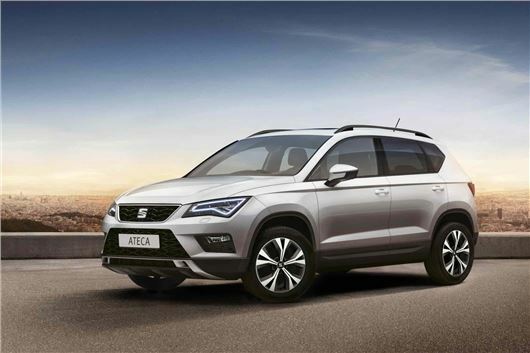 SEAT coaxed around 13,000 UK web users into configuring an Ateca over a six-week period by offering an all-expenses paid trip to Barcelona as a prize to one of them. Unlike a standard configurator, however, the software generated a car configuration for the user at the end of a series of seven questions, based on their answers. The company is yet to announce who has won the holiday. Standard kit on the Ateca, which is SEAT’s first ever crossover SUV, includes 16-inch alloy wheels, a touchscreen media system and air conditioning. A pricing strategy that sees the model start below £18,000 makes it significantly cheaper than its Volkswagen Group stablemate, the Tiguan, which begins at £22,500.